Children will spend hours poring over it... An activity atlas that is perfect to get lost in. In Around the World with Mouk, Mouk is off on a world tour and he sends postcards back home to his friends about his trip. He learns a lot! Hardback with a spongy cover and super-glossy, the book comes with a set of removable stickers. Meet Mouk, a mellow little bear who takes his buddies by surprise when he sets off on an around-the-world adventure that will inspire kids to travel the world and discover different cultures. 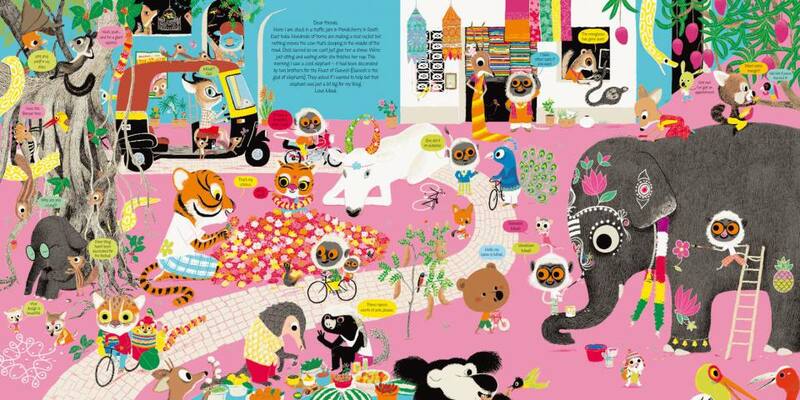 Bursting with colour and a zillion authentic details, Around the World with Mouk follows our loveable, laid-back hero as he travels through 11 vividly illustrated countries, meeting new friends and learning about new places. From every place he sends a postcard to his friends at home. Children delight in discovering a world of realistic details on every page, and learn fun facts from the postcards. The front endpapers feature Mouk getting ready to leave and say goodbye to his friends, while the back endpapers show his return home and include extra anecdotes about his travels. And to make sure the travelling bear is never lost, readers and pre-readers can follow his journey across the map on the back of the book. An optional sticker game lets children learn more about each country in a fun, interactive way. Fruity Bats Book of the Week. game at the back of the book. Around the World with Mouk [is] written with smaller people in mind and [has] a more cartoon-like illustrative style. Mouk (a bear, I think) invites us to follow on his ‘trail of adventure’; it’s rather like Richard Scarry on acid for those of us old enough to remember Lowly Worm and friends. It was a big hit with my three-year-old because of the rather gorgeous collection of stickers that comes with the book, which you can use in the story. Preschoolers will be fascinated by Around the World With Mouk. 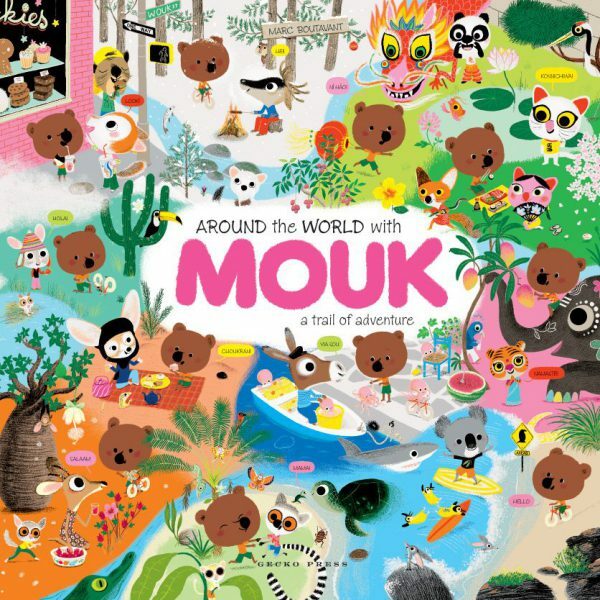 Mouk is a tiny bear who goes on a world adventure to discover 11 different cultures. In each country he meets new animal friends and learns abut the local environment, foods and social activities. Much of the information is in postcards and witty speech bubbles. Boutavant is French graphic artist who has created spectacular illustrations that are a cross between Richard Scarry and Hello Kitty. The pages are glossy, the colours intense, and the characters ooze cuteness. Children will embrace this particular cartoon style quicker than their parents. Removable stickers are a nice bonus. 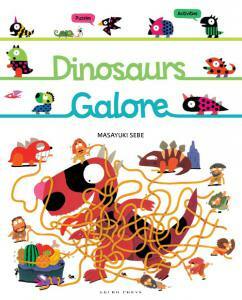 It’s easy to see why Lire Magazine chose this as one of the 20 best French children’s titles of 2007. Mouk is a yellow little bear who takes everyone by surprise when he sets off to travel the world. An absolute interactive gem of a book, it will appeal to children of all ages and for adults to read and help younger ones with. Every page explodes with colour and Mouk finds joy in discovering the cultures of 11 countries through the animals, people and plants, as well as delicious smells. Described as an activity atlas, it is that and more. There is a map on the back cover and removable stickers to be placed on it, so that as well as reading the story children can actually follow Mouk’s journey. They can also see how items travel across the world – for example how a coconut sent on a journey in Madagascar ends up on Australia’s Kangaroo Island. Well worth its price, Around the World with Mouk is a book that can be bought as a gift from several people. children learn more about each country. There is no doubt that Around the World with Mouk is colourful and appealing. It is a large format book with glossy pages. called out Yassou to everyone, even some dried octopus hanging on a clothesline.’) Not as clean as Richard Scarry – though there’s some influence – the artwork is busy, which kids will no doubt love. Fun and definitely unique, with a favourable track record in it’s native France. Think Richard Scarry for the new millenium – Around the World with Mouk follows a cuddly French bear on his big OE as he learns to greet the locals on every continent in their own language, sampling the cuisine along the way. Greece, Africa, Lapland, India, China, Madagascar all feature in this high-gloss picture book, complete with padded cover and removable stickers. Chock-full of the sort of detail kids love … it should keep the most ansty kids amused for long periods. The zappy translation is by Wellington author and Dominion Post television reviewer Linda Burgess. Around the World with Mouk is a colourful tale about a koala (sic) and his travels. This was one of the 20 best French children’s books of 2007, translated by New Zealand author Linda Burgess. For 7 to 10-year-olds, Mouk is a little bear who sets off on an around-the-world adventure, inspiring children to travel and see other cultures. The countries are vividly illustrated, full of facts, and more information [is] on the postcards Mouk sends to friends back home. There’s an activity atlas and removable stickers for children to check the maps and follow Mouk’s journeys and trace various items. Boutavant is a graphic artist, illustrator and comic strip author, and the myriad of details of Mouk’s travels in each country will This was one of the 20 best French children’s books of 2007, translated by New Zealand author Linda Burgess. For 7 to 10-year-olds, Mouk is a little bear who sets off on an around-the-world adventure, inspiring children to travel and see other cultures. The countries are vividly illustrated, full of facts, and more information [is] on the postcards Mouk sends to friends back home. There [are] an activity atlas and removable stickers for children to check the maps and follow Mouk’s journeys and trace various items. Boutavant is a graphic artist, illustrator and comic strip author, and the myriad of details of Mouk’s travels in each country will appeal to the age group, and also introduce different languages. Mouk has appeared in previous books by the author. 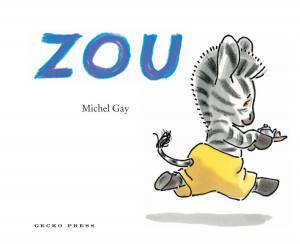 Another of Gecko’s translations of quirky foreign books, this one is bursting with colours that verge on the psychedelic as Boutavant sends his little bear Mouk off on a world adventure. The animal world that the Frenchman creates is painstakingly detailed and brought to life with dry comments shared amoung the characters. As he journeys around the globe, Mouk sends postcards back to his friends packed with fun facts about the places he visits. There are also a couple of pages of removable stickers so kids can create and re-create their own scenes. Meet Mouk, a friendly little bear, who travels to 11 different places around the world, sampling fun and food as he chats to the reader, and sharing facts about the countries he visits in postcards home to his friends. Mouk is a sweet and inquisitive bear who makes many new friends on his journey, all of whom are painted in Boutavant’s cute and extremely hip style. Full of brightly coloured pictures and witty details, Mouk has the same appeal as Richard Scarry’s books and children from age 4 to 10 will spend hours poring over it. With a spongy hardback cover , strong glossy pages, two sheets of reusable stickers and a map of the world on the back cover, Mouk, originally published in France, is like an activity atlas that is perfect to get lost in. Mouk, a mellow little bear, takes his buddies by surprise when he sets off on an around-the-world adventure learning about new places and people. Mouk loves to send post-cards back home full of interesting facts. 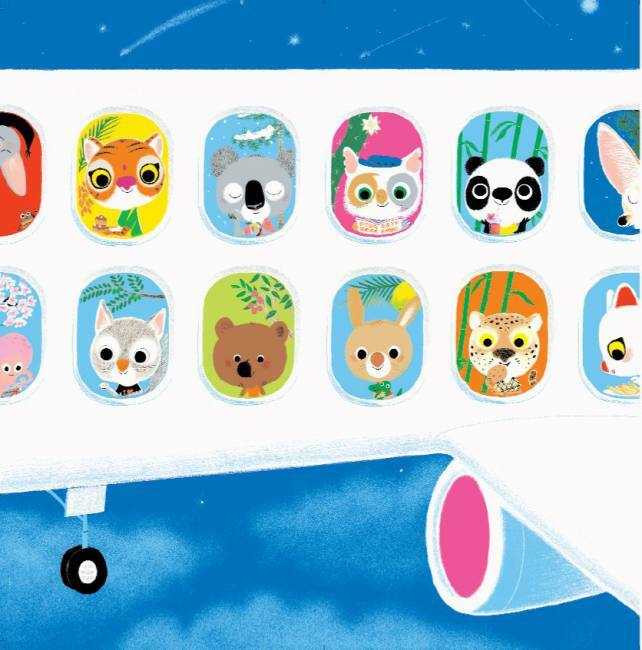 Children will delight in discovering the world alongside Mouk by using removable stickers to further decorate the places he visits. An activity atlas that will give 7 – 10 year olds hours of fun. [This] is basically a travel atlas for children aged between seven and 10 years, in the form of an adventure trail set by a little bear called Mouk who goes off to see the world. This is a clever tool to attract the interest of curious young minds as Mouk writes postcards to his friends telling of his travels. Much of the information about each city or country includes snatches of language, cuisine, animal life festivals, customs and clothing. The pages are bright and incredibly busy, inviting young readers to spend hours poring over the details and learning while having fun. A world map on the back cover shows Mouk’s voyage and there are reusable stickers which can be moved around on the glossy pages . Innovative, colourful and clever. anecdotes about his travels. And to make sure our travelling bear is never lost, readers and pre-readers can follow his journey across the map on the back of the book. Translated from French by Linda Burgess this delightful book is for children seven years-of-age and older. pages later it floats ashore on Kangaroo Island. While the simple colourful illustrations with all their detail seem aimed at 3 to 6 year olds, the language in the postcards and conversations is more suited to 8 year olds. Shared reading with adults would seem the best use of the book. The pages are shiny and durable so that the stickers can be easily placed and removed. The Upstart crew LOVE this book! It is an AMAZING book that will be enjoyed by ALL ages. It’s about a cute little yellow bear, Mouk, who takes his buddies by surprise when he announces he’s heading off on his big OE. From France, America, Japan, and Australia to Peru, Greece, Lapland, India and Madagascar, Mouk meets new friends and learns about new places. This book is wonderfully illustrated and there is even a cool sticker game at the back. 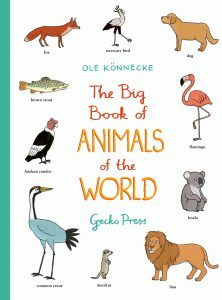 Bursting with colour and a zillion authentic details, this new book from Gecko Press follows lovable, laid-back Mouk as he travels the world meeting new friends and learning about different countries and cultures. I love Mouk! It’s such a happy book, with colourful pictures. I liked picking it up again and again and just looking at one page. It is different to other books too. I love this book too much. It’s like the sunshine turned up on full, with a box of chocolates wearing a rainbow. Inspiring with gorgeous details to discover and delight in…if a book was warm company and happiness – this is it.